John Shelby Spong's greatest act of courage is still ahead of him. It is ten years since the release of A New Christianity For A New World. The main thing that stands out in a thesis that continues his massive deconstruction of the Christian Church is Bishop Spong's personal determination to keep a firm hold of Christianity. A jarring note strikes every time Bishop Spong switches awkwardly between "Jesus" and "Christ". This is most obvious in Chapter 8, Jesus Beyond Incarnation: A Nontheistic Divinity. Bishop Spong wants to find a way to maintain the "Christian" label, while at the same time systematically knocking down every Christian pillar, until he is left with nothing but the tenuous link between Jesus and Christ. That pillar too must collapse of its own accord through the sheer absurdity of trying to hold a house up with only one strut. "Can [Jesus] still be a God-experience for me?" is the question he asks on page 130. Before the end of the chapter he has decided that he can. God is the Source of Life who is worshiped when we live fully. God is the Source of Life who is worshiped when we love wastefully. God is the Ground of Being who is worshiped when we have the courage to be. Jesus is a God-presence, a doorway, an open channel. The fullness of his life reveals the Source of Life, the wastefulness of his love reveals the Source of Love, and the being of his life reveals the Ground of Being. That is why Jesus continues to stand at the heart of my religious life. That is also why I continue to call him "my Lord" and to call myself a Christian. This is an unnecessary leap to make. Just because Bishop Spong regards Jesus as his pointer to God does not necessitate the need to cling to the "Christian" label. All it does is betray a false sense of loyalty to the Church. What has Jesus being a wonderful example of the God-experience got to do with the title "the Christ"? Jesus and "the Christ" are worlds apart. They are not synonymous. "Jesus is my way into God," is Bishop Spong's reason for keeping hold of Christianity. Jesus demonstrated a life in union with God, but he is not essential to our discovering a life in union with God. Bishop Spong cannot point to Jesus, who in turn points to God. Spong himself must point to God. Jesus points the way to God and then steps away having played his part. The person he pointed to God in turn points the next person to God, and then steps away. It is not about the person who points the way (though that may be very much appreciated), it is about one's own personal relationship with God - or Ground of Being/Source of Life, whatever term you might favour. Perhaps it is not easy for him to relinquish the office of Bishop - to finally lay down the clerical collar and purple garb for good. He will be able to do it one day because that is the conclusion his life is moving inexorably towards. He obviously has a deep felt loyalty to "Christianity" and all it has done for him. It must be remarkably difficult to abandon it. Perhaps he believes he can do the most good trying to change things from within. But the Christian Church will not be changed from within. It must be abandoned. The taint of Christianity cannot be avoided. God and religion must be separated. Christianity will not change, it must die. Whether it will or not is another matter. Its demise could be dignified if people only realised they could admire Jesus without messing it all up with the Messiah. Bishop Spong has not discovered his authentic self. When he does, and realises he cannot stay within this antiquated system, he will leave and they will say, "Good riddance!" His fellow believers have already branded him a heretic. This devastating life-changing epiphany is yet ahead of him. In 2012 he is still addressed as "Bishop" Spong. He is still a champion for Christianity. At the time of writing A New Christianity For A New World he was still able to perform the Christian liturgy, but he had to engage in some mental gymnastics in order to utter the banalities he does in his office and capacity as a bishop and minister. 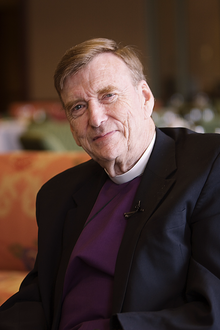 Although he claimed, "This will in all probability be the final theological book of my life and career," I predict that John Shelby Spong will write another book sometime in the future charting his eventual departure from Christianity altogether.